4 - Decide if you need to use the Tension Index feature (like in 6Days1967, Mali2012, Korea1950 or Berlin1945), i.e. something that move up/down on a scale and gives either VP or full victory and that can also be used to trigger some cards effects...e.g. if your index reach 10, you can decide that Spain will send more/less troops, etc...etc.. I would suggest that you put all the above and more in a single document and exchange it with us for further advancement. How many regions is the best? It is a continental war, from Texas to Patagonia, with some regions of greater interest (more provinces), how many? Little armies (<10.000 vs <10.000 men): historical units of infantry battalions / and cavalry regiments could be possible. There are hundred of events, How many cards could be best? Yes, 1820, the rebellion of the expeditionary army in Spain deposed the king in Spain and did not embark. It is the turn point of the war. Give me some vanilla recommendations please. Yes, same scale as Saratoga 1777, more or less. Squadrons for ships. OK, so your system would call the tension index (TI) for instance « Army Rebellion » and it would start at zero value, then pro-rebel actions would increase it by +1 and pro-royalist actions the reverse (e.g. -1 when they capture rebels capitals or kill enemy leaders), and the Royalist lose the game when it reaches 10 or (better) 20…variation could also come from cards, random or mandatory to plays. 1- OK, this point is very interesting. Historically, until 1820 the war is indecisive. This period 1810-1825 could be the game in essence. A-The historically correct ones are that the expeditionary ones revolt (Trienio Liberal)- then, it is possible in the game that the scenario continues until the year 1825, as also it happened of truth (it finishes in the turn 30). It can be possible to do more easy, high probability? B-The what if: there is not a rebellion of spanish expeditionaries forces, there are not a liberal revolution in Spain. The king is in command and the war can be extended to year 1830 (turn 40), with disembark and invasions from Mexico to Río de la Plata (ends on turn 40). It is historically correct (I have a book with the project of invasions;)) Is it possible to do this more difficult, low probability? 2- Secondly, it is possible to avoid totally unhistorical failures, ie that certain caudillos (and some units as militias) that do not appear in certain countries, or can not move from one country to another. For example, Bolívar was never in Mexico. It is possible to restrict movement to certain regions, or disband this units in this case. What is possible to do?. Yes, it is very easy to limit access of units (leaders included) to only some parts of the map...e.g we do that in Six Days 67 (the Syrians can not enter in Jordan or Egypt) and plenty of other games. The map is intended to cover all the scenarios of South America, the Caribbean, Mexico and Texas. The scenario wants to make a tour of all its processes of independence in the Americas, not only of the monarchy of Spain, but independence between the republican countries. 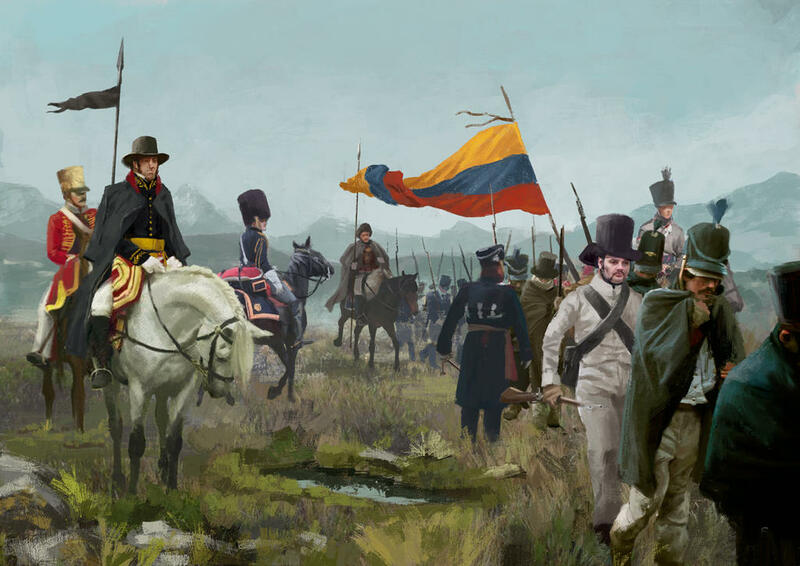 The leaders of the movement are the main caudillos, like Bolívar, but there is an important intervention of Foreign Volunteers in their armies, and other powers, such as the British and the Portuguese interventions. And the ocean, which surrounds the ground scene, is full of islands and bases of French and North American filibusters and corsairs. We seek a high historical accuracy, but several possible variants can be presented, with the appearance of different international events that occurred between 1810 and 1830, from the Holly alliance, to the Monroe doctrine, and a possible rescue of Napoleon from the island of St Helena, which can have a huge weight in the conflict and change the course of history. But there is still a lot of work ahead to reach a good ending. 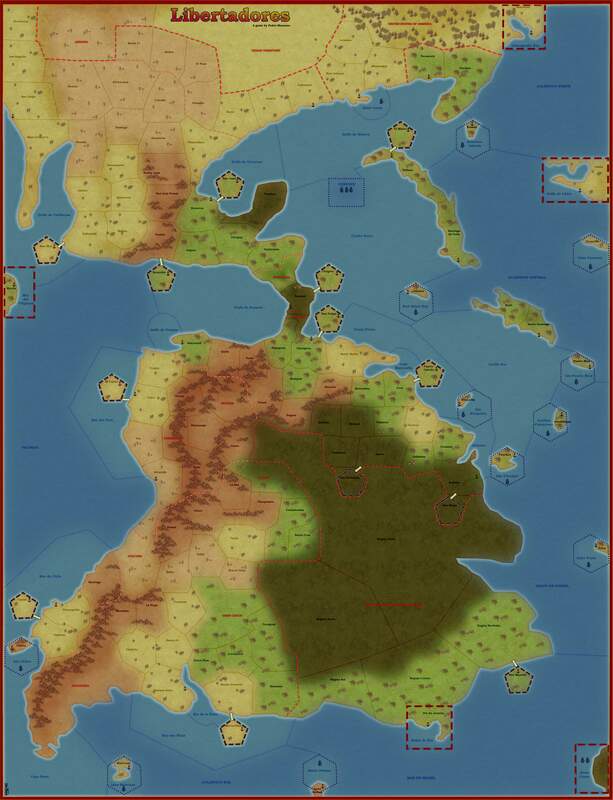 Nice map, I'm going to play a bit with the editor, I would like to try a Napoleonic ship of the sail mod, in the way of boards games like 1805 or Sovereign of the seas.